191. Real Changes Ahead for Veterans Affairs? President Obama became the 44th President of the United States this past week. He certainly faces many challenges as he embarks on the Presidency. Throughout President Obama’s campaign there was a theme of change that surrounded his visions of the government he would lead. The time for putting these changes into place has arrived. After reading these words I paused to consider “a new age of responsibility” as relates to our homeless veterans . 25% of our nations’ homeless are veterans. These same homeless Americans have at one time in their lives gladly seized the duty of serving our county and shown the true character of patriotism. Many of these same veterans are now living in poverty and homeless throughout America. Those who have already given their best to our country have found that our country has forgotten our responsibility to them. Lost in all the hubbub of Tuesday’s inauguration of President Obama was the confirmation of retired Army Gen. Eric Shinseki to head the Department of Veterans Affairs. This is one of the first changes in store for The Veterans Administration and hopefully it will mark the beginning of a new era in the way our country serves all our veterans. The VA certainly is in need of much needed changes in the way it serves all veterans of our country, especially in the lack of adequate services it provides for our homeless veterans. To have a government organization whose sole purpose is to serve the needs of our veterans yet to have so many of our homeless veterans without a place to call home speaks volumes about the character the VA during recent years. I truly hope that all citizens of the US take to heart the following words by our President and consider how we all must reaffirm our spirits of care and compassion to homeless veterans (and all homeless citizens) of our country. It is through much needed changes in the area of veterans affairs that we can show how important it is to accept responsibility for all veterans and move in the direction of much needed change. The time has come to reaffirm our enduring spirit; to choose our better history; to carry forward that precious gift, that noble idea, passed on from generation to generation: the God-given promise that all are equal, all are free and all deserve a chance to pursue their full measure of happiness. Now that the time for change has arrived I hope that all those who have taken the oath to serve this country stand by their campaign promises. 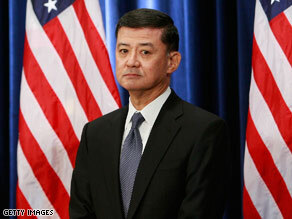 General Shinseki has much change to oversee. In these changes there can be great pride in knowing that the VA has returned to it’s core mission of a commitment to the welfare of our veterans. I really want you to be right. Gen Shinseki has always struck me as an honorable man. What happened to Obama’s “Zero Tolerance” for homeless veterans? More Religious Faith based nonsense, jammed packed warehousing, forced 12-step insanity, dead-end jobs “training” sorting clothes at goodwill. I’m sorry but you saying that line “the VA can only break the law only as long as you and I let them”…the VA has been breaking laws for as long as they have been around….new laws Bush had laid down was making movement easier for vets not to having war crimes commited on them by letting them press charges on these criminals. If it’s harder to even get treatment, how does that make it easier? This Bites! Last week I was run off the VA base for no reason at all and I’ve seen it done to other Vets too. Now when I go, I take a witness with me and make them stay with me at all times. If they can’t…I leave or cancel the appointment.